The International School “Escuela Campo Alegre” has Installed a New World Class Synthetic Grass Roof Top Athletic Field with an AirField Systems Drainage System. The Athletic Field was Designed and Built on Top of a Four Story Parking Garage and Partially Into the Side of a Mountain at its side housing a 80,000 gallon tank to capture water for collateral irrigation. 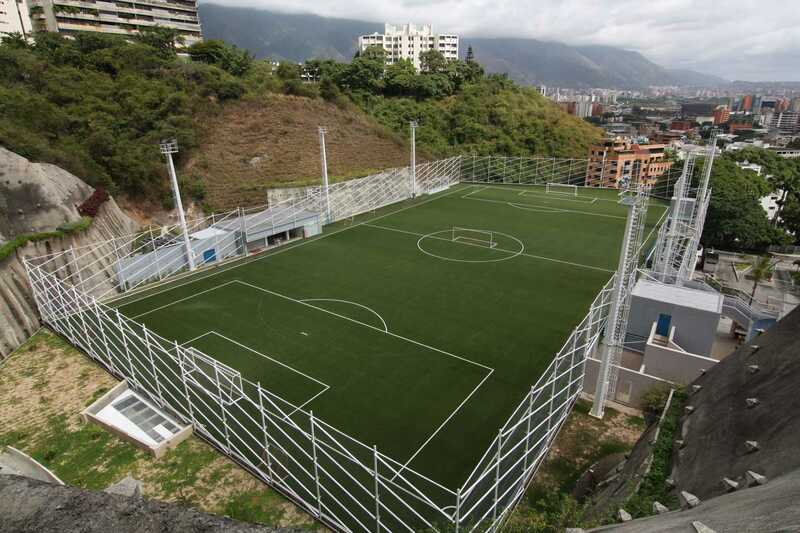 Artificial grass sports field roof top, built partially into the side of a mountain. Established in 1937 Escuela Campo Alegre is an accredited North American International School located in Caracas, Venezuela. Throughout its history the school has provided innovative education which focuses on individual student needs. Therefore, it comes as no surprise Escuela Campo Alegre chose the AirField Systems AirDrain for the schools new state of the art athletic field complex, located on top of its latest extension, a three story building, housing an early childhood center, a gym, which can be divided into three multiple use courts, and maintenance areas, designed by Kunckel Arquitectos Asociados (glocalstudio Caracas) and H2L2 of Philadelphia. AirField Systems provided a state of the art synthetic roof top turf field which eliminated the need for rubber infill and kept the school consistent with their mission statement of using new and innovative technologies. On the Synthetic Grass Roof Top the AirDrain geocell layer located directly beneath the synthetic turf, the children enjoy consistent playability due to AirDrain’s constant and never changing G-Max. G-Max is a test that measures surface playability in natural grass and synthetic turf athletic fields. Recent ASTM testing provides evidence that the AirDrain geocell acts not only as a drainage layer but as a shock pad as well. Measuring shock attenuation through testing, the AirDrain geocell allows for uniform shock absorbency and reduces strain on ligaments and joints. Additionally, the school requested a system that captures, stores and reuses the storm water and irrigation that passes through the field. An 80,000 gallon water tank was installed at ground level that captures and reuses water for school facilities, irrigation of existing landscape, and reduces the temperature of the field during hot summers. The American Institute of Architects and the United States Green Building Council have both approved the Airfield System continuing education course entitled “Synthetic Drainage for Sustainable Design in Modern Sports Field Construction”. The continuing education course discusses all aspects of the AirField System including the Texas A&M Research Project in partnership with the USGA. It also defines the basic components of the system, explains it’s sustainable attributes and reviews case studies revealing what makes the AirField System the number one choice for architects and engineers all across America.